Does this medical series have a chance at survival? Has the Code Black TV show been cancelled or renewed for a third season on CBS? The television vulture is watching for the latest cancellation and renewal news and this page has been created to give our readers a dedicated place to track the status of Code Black, season three. You can bookmark this page or subscribe for the latest updates. Remember, the television vulture is watching your shows. Are you? Airing on the CBS television network, season two of Code Black is averaged a 0.97 rating in the 18-49 demographic with 5.98 million viewers. Compared to season one, this season is down by 24% in the demo and down by 16% in total viewers. 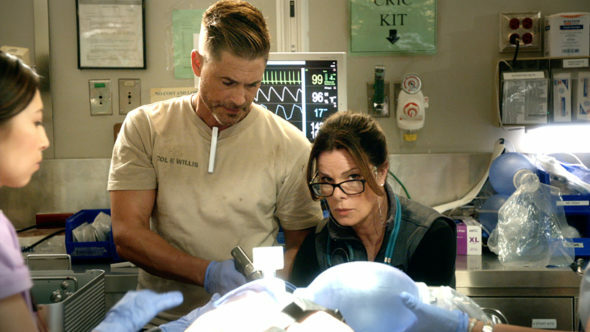 Find out how Code Black stacks up against the other CBS TV shows. On May 14, 2017, Code Black was renewed for a third season which debuted on April 25, 2018. Go here for updates. After a lackluster first season, some significant changes were made to Code Back for season two. Unfortunately, the changes didn’t seem to help and the ratings have gotten even worse. I suspect that Code Back will be cancelled by May. The television vulture is preparing to call a time of death on this medical drama. Read other Code Black TV series news or other CBS TV show news. What do you think? Were you hoping that the Code Black TV show would be renewed for a third season? Would you have been upset if this CBS show had been cancelled instead? I really like Code Black and was hopeful it would not be cancelled the show has some good story lines and great actors. There are not many drama shows on TV and not many medical shows that are written as well as Code Black. Code Black is one of the best shows on TV. Great cast and stories. How you you cancel it?? There are so many other really bad shows on. Mostly reality. Cancel them. KEEP CODE BLACK ON! I personally love this show. The people go thru hell and high water trying to help people who sometimes want it and other times don’t. They beat their heads against the wall trying to juggle their personal and professional lives. If you don’t like this show, it is because you can’t handle reality and what it is like in the real everyday world. Please renew it for Season 4.